How do I buy a Beeline Bikes Franchise? Make a Beeline for this Opportunity. Beeline Bikes is a business built by mechanics for mechanics and they're taking a new approach to the bicycle industry. By enabling customers to schedule a Mobile Bike Shop at the time and location of their choosing, they are reinventing how people interact with bike shops by providing the ultimate in customer convenience. In just two years, they have surpassed the expectations of thousands of customers. They accomplished this by supporting them at their homes and at over 100 corporate partner locations throughout the San Francisco Bay Area. How the business model works; fleet doubled in 2014; and now there are franchise opportunities in a market near you. Open Beeline Bikes in any of these available states: AK, AL, AR, AZ, CA, CO, CT, DC, DE, FL, GA, IA, ID, IL, IN, KS, KY, LA, MA, MD, ME, MI, MN, MO, MS, MT, NC, ND, NE, NH, NJ, NM, NV, NY, OH, OK, OR, PA, RI, SC, SD, TN, TX, UT, VA, VT, WA, WI, WV, WY. Beeline enables you to build your own business by meeting the increasing demand with a differentiated model customers love. 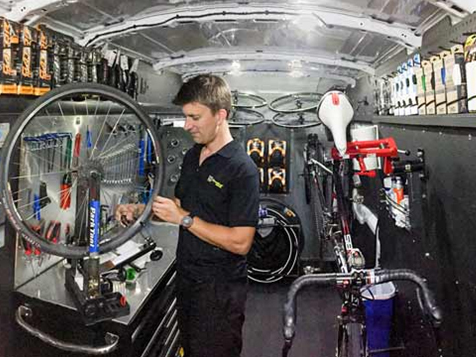 Most Beeline Bikes Mobile Bike Shops are built using Ford Transit High Roof Vans, which include infrastructure upgrades to enable bike repairs to take place directly inside the vehicle. Beeline Bikes mobile bike shops generate revenue from both service and product sales (including new bike sales). Mobile bike shops make house call and workplace visits. Some corporate visits are subsidized by the employer or property manager. 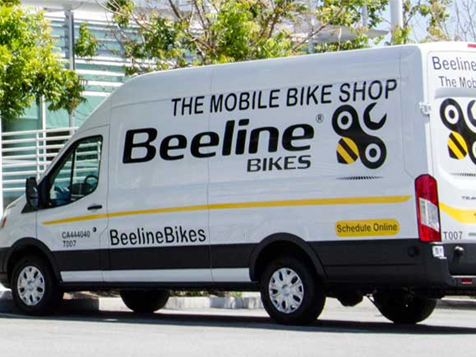 Don’t miss your opportunity to be the first in your market with a Beeline Bikes mobile bike shop! Beeline Bikes is not currently active in our directory, but here are some other recommended selections for you to explore.